Membership to our chapter is open to all members of the bleeding disorder community. 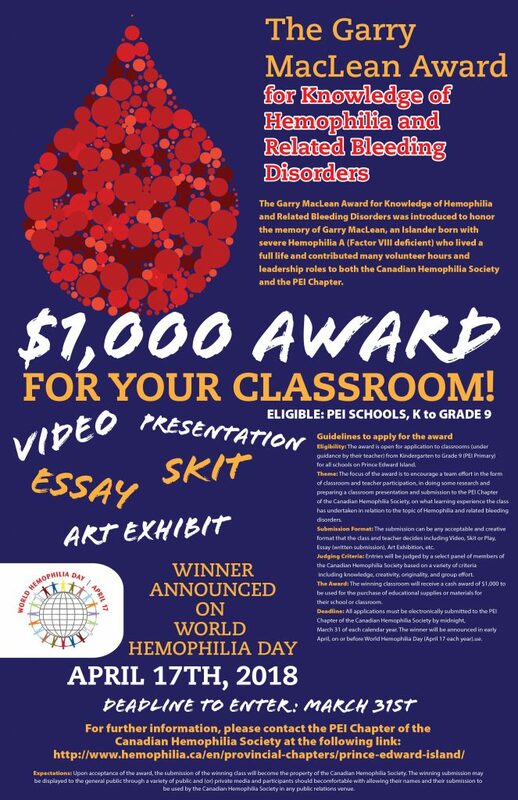 The Garry MacLean Educational Award for Knowledge of Hemophilia and Related Bleeding Disorders was introduced and approved by the membership of the PEI Chapter of the Canadian Hemophilia Society at their semi-annual meeting in the fall of 2017. It was developed to honor the memory of Garry MacLean, an Islander born with severe Hemophilia A (Factor VIII deficient) who lived a full life and contributed many volunteer hours and leadership roles to both the Canadian Hemophilia Society and the PEI Chapter. The award is open for application to classrooms (under guidance by their teacher) from Kindergarten to Grade 9 (PEI Primary) for all schools on Prince Edward Island.